Australian grayling showed a great response to environmental watering in the Tarago River in 2015–16 after a drier-than-average late summer and autumn. 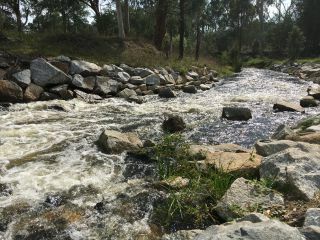 Environmental watering in April 2016 aimed to trigger Australian grayling breeding, flush fine sediment and organic material from the river bed and maintain habitat for waterbugs and fish life. "Egg and larval sampling is how we determine whether or not a fish species has spawned or produced eggs," said Melbourne Water's Sarah Gaskill. "Early indications are that there was strong spawning by Australian grayling in response to environmental watering during April 2016." Survey results also show more grayling in the river following the increase in flows generated by environmental watering. Young fish also migrated. Australian grayling breed in the lower freshwater reaches of the system before the eggs and larvae drift out to sea. The young fish spend about six months in the sea before they migrate upstream. The timing of Australian grayling migration is measured by undertaking chemical analysis of their ear bone to determine when they moved from the marine environment into freshwater reaches. Water quality also improved following environmental watering, moving fine sediment in the river to create habitat suitable for fish, frogs and platypus. 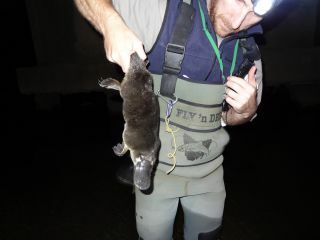 Platypus showed an encouraging response to environmental watering, with monitoring indicating a slight increase in platypus numbers in the river. There were also sightings of young platypus. "The environmental flows released by Melbourne Water from Tarago Reservoir over the last few years have brought a lot of activity into the Tarago River," said Jeff Smythe, Coordinator of Friends of Robin Hood Reserve. "We've seen large schools of native grayling, many ducks and waterfowl and the odd freshwater crayfish crawling about. And of course the local platypus are very happy." Environmental watering improves the health of rivers and increases recreational opportunities for people living beside or visiting the Tarago River. Melbourne Water's Sarah Gaskill said, "There is a very popular caravan park along the river and the picnic spots make wonderful stopping-off points for people along the Tarago. Fishing is also a popular recreational activity with many eager anglers awaiting a bite."